What sights or sounds do you find cringe worthy? For instance, some people cringe when they see a hair clog pulled out of a drain. Others cringe when they hear fingernails put to a chalkboard. And you? Is there anything that curdles your blood or sends shivers down your back? Loose, wiggly teeth: they set me off. Why? I’m not sure. All I know is that when one wiggles, I wig out! Luckily my adult teeth are fairly secure in my mouth so my cringing has been under control for a few decades or so. My oldest child, on the other hand, has been beckoning the Tooth Fairy to visit with her now gapped grin. As I watch three sets of teeth scurry around my house, I am keenly aware that my days of cringing have only begun. 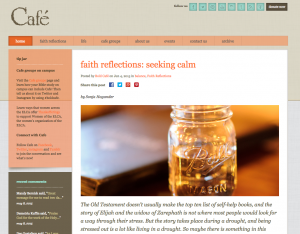 “Faith reflections: Seeking calm” by Pastor Sonja Hagander, College Pastor and Director of Ministries, is featured in the current issue of Café, Women of the ELCA’s on-line magazine.